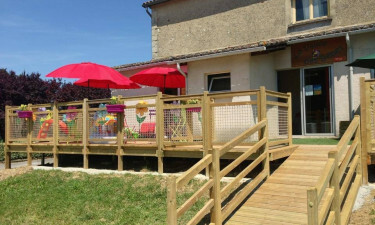 Village Lac des 3 Vallees - Pyrénées, France - Book online today! Are you looking longingly through travel brochures and websites at the moment, trying to identify your next camping holiday destination? 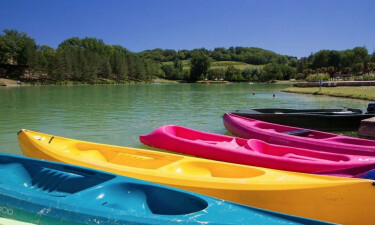 Why not give LUX-camp Le Lac des 3 Vallees a chance to prove to you that the Gers region of France is every bit as beautiful, relaxing, yet fun-packed as the Languedoc-Roussillon or Provence? Rent a mobile home at the holiday camping site and you are practically guaranteed an unforgettable holiday with friends and family that will please all ages. Why stay at Le Lac des 3 Vallees? Campsite located directly by a lake, surrounded by golden sunflower fields. River for fishing, sailing and boat tours nearby (just two kilometres). Onsite LUX-camp water park, providing a safe environment for children to swim and have fun. Pet dogs are allowed throughout the season, allowing four-legged family members to join in the camping holiday fun. Not everyone feels that staying in a well-appointed mobile home or luxury tent means that cooking meals every day of the holiday is a given! The luxury camping site naturally provides guests with a choice; the LUX-camp's restaurant offers a wide selection of meals for all tastes and appetites, while snack bars cater for small tummies in need of hot dogs, burgers and bags of chips after their water park adventures. Famous for its golden sunflowers and rolling green fields, the Gers offers cyclists and hikers wide scope with its bike and walking trails. 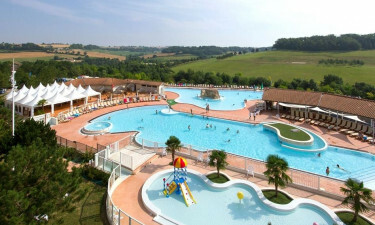 At the 140-hectare site of LUX-camp Le Lac des 3 Vallees, guests can enjoy water sports including swimming, snorkelling, sailing, surfing and fishing – all within a few steps of their mobile home or luxury tent. Children have their own play area where they can let off steam and make new friends during their camping holiday. An open-air pool, sauna and tennis, table tennis and mini-golf are waiting for campers of all ages to have a go! Just four kilometres from the camp, guests can try out thermal baths for total relaxation. Still within cycling distance, a golf course offers golfers a thrilling day of play against the backdrop of the Midi Pyrénées. A local bus service provides for guests who want to explore a little further afield and feel their luxury camping experience should include a glimpse into the culture and heritage of the Gers region.